Forum Index > Off-topic Talk > A Good Bronze for Blades? Posted: Thu 04 Mar, 2010 8:31 am Post subject: A Good Bronze for Blades? I am considering making a sailor's knife for a project in school. I was thinking of making out of bronze to avoid the corrosion issues of steel, but I'm not sure what kind of bronze would be most suited to the task. I was thinking of silicon bronze (what is used it boat propellers by the navy, or so I am told) because I found it to be very hard and corrosion resistant when I used it in a bronze casting class - does anyone have any recommendations? You can forge aluminum bronze. It also takes cold working reaching a higher hardness. I have made a few test blades of this material. It is sensitive to temperature: too high temperature and it will crumble like sponge cake. Too low temperature and it will want to crack if you forge it too hard. You can do some limited shaping cold, but it grows hard pretty quickly. You will never get the hardness of a steel blade, but with the right blade shape and right geometry you can get a very decent and functional knife. I have thought about making a personal knife for myself out of this material, just because it would be fun to use and a bit different. Aluminum bronze is very stain resistant. It is used for casting propellers for sea going ships because of its toughness and stain resistance. 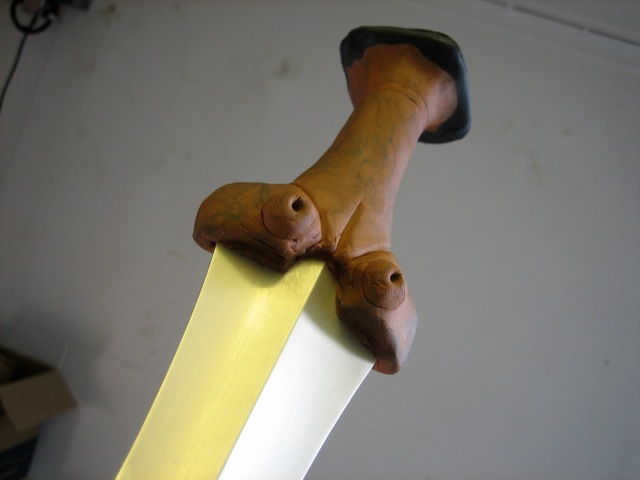 Below a test blade with a mock up hilt of plasticine. It is forged hot, with cold worked edges and the ground and sanded. Posted: Thu 04 Mar, 2010 1:31 pm Post subject: Re: A Good Bronze for Blades? Is it purely functionality your after? In that case, modern heat treatable stainless steels will outperform bronzes. 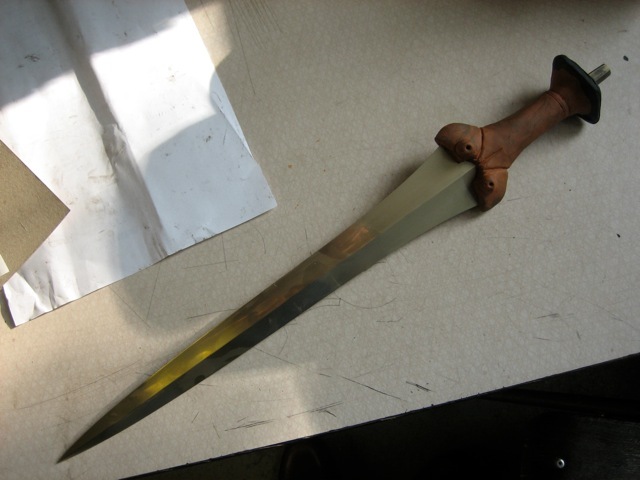 In principle, workhardened bronze can make a pretty decent knife, but it will bend easier and loose it's edge quicker. Mind that I'm a bronzeaholic, so I prefer a nice bronze knive on aesthetics anytime, but there's a good reason no bronze knives are made anymore today (while they were occasionally still made until fairly recent, when hardenable stainless steels were not yet available). Peter, thank you very much - that is precisely what I was looking for. I haven't tried or read about hot-forging bronze; is there a visual indicator of the appropriate forging temperature? Jeroen - I was mainly aiming for pure functionality, but after thinking about it I am also after making something a little different than what is available via mass production. Is there a particular alloy of stainless steel that you recommend? Thank you both very much for the advice; it is very helpful. What era are you going for? If 17th/18th century, was bronze used for blades at all during that time period? I don't know if historical accuracy matters in this project, just something to consider. AISI 440 does not resist oxidation as AISI 303, but in return offers a good hardness. not good for saline environments. I am not shooting at making a historical piece per-se, but I am interested in making a functional piece, and looking at historical models from as many periods as possible would certainly help me design a good one. Any images of nautical knives from any period would be very helpful. Maurizio - I am a little confused by your post; are those two stainless steels that you would recommend with pros and cons? Well, only Aisi 440 is good for knives. It is hardening. But only for knives, not swords. Ah, I understand now. Thanks very much! You might also want to check out Ben Potters website, he has a neat sailor knife on there right now. It might serve as inspiration. I am curious though, was bronze used in maritime knives (specifically blades) in the 17th/18th century? You forge it in the red to yellow orange range. The colors do not show as readily as with steel, not as luminous. There will be a chalky layer of oxide that have an effect on color. If you work in a room that is not brightly lit, this will help observing the right temperature. This is just after a very quick search. I am sure there are more info on the net. Search for Forging aluminum bronze. You´ll get many hits. A bronze knife will be a nice conversation starter, and it will impress by looks and since people have a rather low appreciation of bronze as a blade material. It will cut, but like others have said: it will not hold an edge as well as a good steel. In a using knife the first big question is how important it is for it to be stain resistant. If you care about a really sharp edge and ease of re sharpening, you might want to look at carbon steels alloyed with tungsten or vanadium. A fine geometry will give you effortless cutting, but demands more awareness in how you use your tool. If you do not mind wiping down the blade and take it to a stone or leather strop, you can maintain a carbon steel knife well and it will give you very little trouble. Higher amounts of carbides may provide better wear resistance, provided the effective edge is less fine than can be had with a simple carbon steel. Stainless keeps rust away, but so can you if you treat the knife right. This is a big topic of debate and you will hear many differing and conflicting opinions regarding the benefits of high alloy vs simple carbon steel. Thank you everyone, you have given me a lot to think about. I will consider my options, and post the results when I finish the piece. More suggestions and information are, of course, welcome. Sailors knives can be made very well of (non-stainless) carbon steel. Especially in the age of sail, but today as well, sailors use their knives daily, so the knife will not have the time to rust. Even today, some of the better sailor's knives are made of carbon steel. Diving, on the other hand, is something different. As I understand it, bronze knives continued to be used for diving until the arrival of stainless steels. Simple AISI 420 might be a good choice. If you want something different, a historical bronze, like 12% Sn - 88% Cu, would also make a good knife. It won't hold an edge as well as a stainless steel knife, let alone a carbon steel knife, but it will hold an edge well enough to be completely functional. I don't know about aluminium or silicon bronzes. They make good propellors but a propellor is not a knife.